Please post all your comments, questions and info regarding the Rolling Stones No Filter Tour 2017 in Copenhagen Denmark here. Edited 1 time(s). Last edit at 2017-05-28 14:39 by bv. Prices go from 550kr to 2450kr. Copenhagen the city of Dreams!!!! One of the best places to Catch the boys! Always on form in Copenhagen!!! Prices are high in CPH. 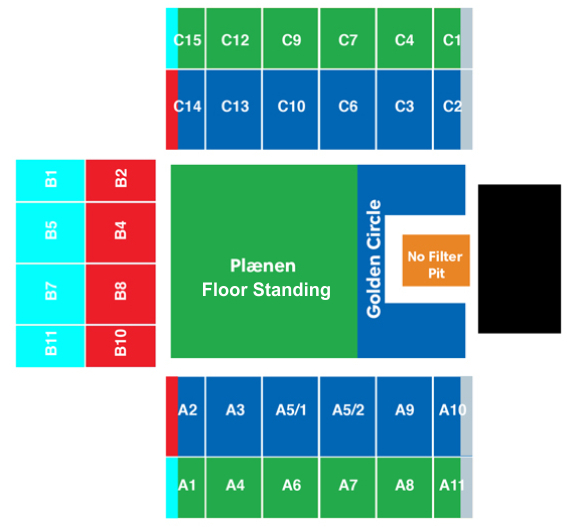 No Filter pit is 2.490 kr., Golden Circle is 1.990 kr., ordinary stands are 990 kr. According to google maps it's a 30-40 minute drive. Public transport about the same. Stadium is in the city. Some 15 minutes to walk from several train stations. Bus going nearby - maximum 5 minutes walk. Of course buses are crowded when lots of people going to a concert - 50.000. Early October, the weather should be good enough. If it rains, they will cover the stadium with a roof. The only bad thing, the sound can be terrible - it is a "concrete box". If the sound equipment and sound guys are good enough, it should be possible to fix before-hand. Challenge is to adjust for 50.000 people in the stadium and a possible roof. Any tips for someone driving in from Sweden? Is there a strategically good place to park (i.e. cheap parking near public transport leading directly to the venue) anywhere? What's wrong with the sale for Copenhagen? the red TICKETS button over RS APP PRE-SALE ????? Thought the presale goes 10 AM local - in about half an hour? But there are NO presale button and the same goes for Barcelona!! The button goes live as the clock hits the hour I believe. You may also want to log out and back in on the app - that helped me with Stockholm. Don't use the app for the actual purchase, instead copy the link the app opens on your clipboard and e-mail it to yourself so you can buy the tickets on your desktop. MUCH easier with the captchas and stuff. Edited 1 time(s). Last edit at 2017-05-15 10:42 by Topi. i'd be greatful for any link, amex or no amex thanks! Logged in on the hour, got easily through. No pit available, then nothing but rafters. Yes, seems like they run some browsercheck, and route you to the standard site if you use another browser than your phone maybe.. but it´s really the best site so far for me to use with a phone.. no captcha! My friend and I got 2 golden circle easy! I am using a browser in the above link no problem - except that there doesn't seem to be any pit tickets available. A few golden circle are still cropping up. Got mine. A friend gave me a special pre-sale link. See you on october 3rd. Weird, what browser are you using ? Neither Chrome nor FFox work for me. It works fine on my iPhone, but it won't let me buy even 2 GA. I entered the app at 10. I have closed it and re-tried time and again, but no. WHY? Try Opera too. TM works well with Opera for me.